The IOF Map Commission welcomes you to the 11th International Conference on Orienteering Mapping that will take place in conjunction with the World Orienteering Championships in Aichi, Japan. The conference has become a traditional biennial event where map makers from around the world discuss and share information about the latest: mapping standards, techniques and developments in a relaxed and informal atmosphere. We are convinced that the 11th ICOM will live up to the successes of its predecessors. The programme has been arranged to make it possible for you to take part in the public races and other important events. Once again, the IOF Map Committee welcomes you to Toyota City, Japan and we look forward to meeting you there. The conference will take place in Toyota City (Toyota Kinro Fukushi Kaikan) relatively close to the suggested hotel for IOF delegates and guests (see the map at the end of this page). The participation fee is 2000 Yen which should be paid upon registration in cash. zetor@ludens.elte.hu. Local registration is also possible. The registration fee covers the conference cost (the coffee breaks are included, but the lunch is excluded; there is a restaurant in the conference building, where every participant can have a lunch starting with about 600 yen). Deadline for entry of official WOC accommodation is 30th June 2005. 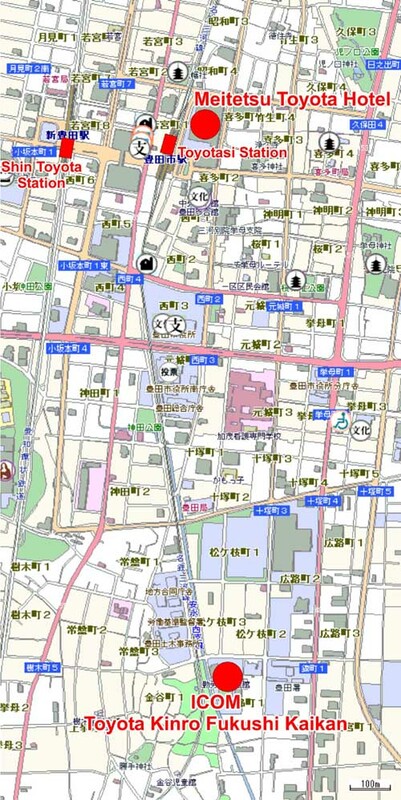 The IOF Map Commission organizes the 11th ICOM in Japan during the WOC on 6 August 2005 (see http://lazarus.elte.hu/mc/11icom/11icom.htm for more details). We traditionally organize a small exhibition during the ICOM or WOC2005. For this purpose we are asking your contribution to show interesting orienteering maps. The theme of the exhibition is STEEP TERRAINS.